A sea of crimson and gold filled the foyer of Jack Yates High School on Oct. 16, as guests donning the school’s colors gathered to celebrate the grand opening of the new 208,000 square foot building. A host of special guests and community members joined students, faculty, and staff to recognize the special occasion. The festivities kicked off with high energy as the school’s Marching Motion band provided a show-stopping performance. This entry was posted in 2012 bond, Business Operations, District IV - Jolanda Jones, High Schools, Magnet/School Choice, News and tagged 2012 bond, Jack Yates HS on October 19, 2018 by HISD Communications. Tiffany Guillory has been selected as the new principal of Yates High School. Guillory began her career as an elementary teacher in Goose Creek ISD and as a middle school mathematics teacher in Fort Bend ISD. 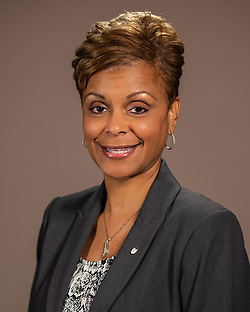 Guillory has served as an instructional coordinator, dean of students, lead administrator and associate principal of Westbury High School and Fondren Middle School. For the last three years, Guillory has served as the dean of instruction at Yates. She graduated from Lamar University with her Bachelor of Science and has a master’s degree from LeTourneau University. She also completed the Rice University REEP Program. This entry was posted in Staff updates and tagged Jack Yates HS on June 18, 2018 by HISD Communications. Construction of the new Yates High School is more than halfway complete, with crews already in the process of installing floors, painting walls, laying pavers, pouring sidewalks, and erecting permanent fencing. A CenterPoint transformer and meter also has been set, meaning power soon will be connected to the building, allowing crews to begin testing mechanical systems inside the building. The main entry facing north is nearly complete, with the main entry facing south and building signage soon to follow. The elevator also will soon be installed, and project officials plan to begin ordering new furniture in January. This entry was posted in 2012 bond, District IV - Jolanda Jones, High Schools, New schools and tagged 2012 bond, BuildHISD, Jack Yates High School, Jack Yates HS, Yates, yates high school, Yates HS on December 14, 2017 by HISD Communications. When construction of the new Yates High School is complete next year, it will offer unparalleled views of the city with Downtown Houston to the north, Texas Medical Center to the south, and the Galleria to the west. The 360-degree view — which includes University of Houston to the east and Texas Southern University to the west — is already visible from top floors of the building, the construction of which is almost a quarter of the way completed. This entry was posted in 2012 bond, 21st century schools, District IV - Jolanda Jones, High Schools, New schools and tagged 2012 bond, BuildHISD, Jack Yates High School, Jack Yates HS, Yates, yates high school, Yates HS on June 6, 2017 by HISD Communications. The Lion’s Den at Jack Yates High School roared with excitement as the graduating Class of 2017 scribbled their signatures on the final steel beam to be erected in the construction of their new school. Once all seniors had signed, they joined with school staff to watch as the beam was hoisted into the air and placed in its new home — the auditorium. The beam will be installed and left exposed, showcasing the signatures from the class of 2017. This entry was posted in 2012 bond, 21st century schools, District IV - Jolanda Jones, High Schools, New schools, News and tagged 2012 bond, BuildHISD, Jack Yates High School, Jack Yates HS, yates high school, Yates HS on April 20, 2017 by HISD Communications. Millionaire Club Spotlight: What Are You Reading This Summer? HISD’s Millionaire Club is a literacy initiative designed to encourage students to read for pleasure during the summer months. Each week, we’ll catch up with one HISD librarian to find out what’s on his or her reading list. 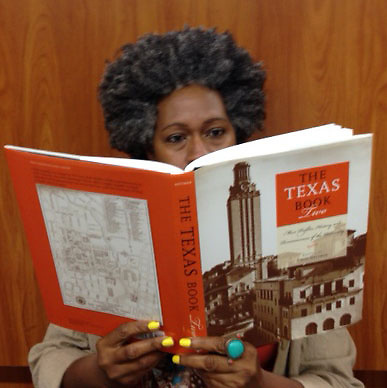 This week, we spoke with Velda Hunter, a librarian at Jack Yates High School. What are you reading right now? What attracted you to those selections? I never read just one or two books at a time. I am reading a variety of good reads, including high school Name That Book selections. Mystery is my favorite genre, so the mystery-thriller Gone Girl by Gillian Flynn is one of the first I chose from the new Name That Book list. This entry was posted in High Schools, Summer programs, Uncategorized and tagged Jack Yates HS, millionaire club on July 29, 2013 by HISD Communications.